Just down the road from the town of Calistoga, Clos Pegase sits on an amazing piece of ground. You'll find serious, passionate estate-grown winemaking balanced with an open-hearted spirit of sharing and celebration. You'll find a majestic modern space that's both awe-inspiring and welcoming. Wine that offers both true varietal intensity and food-friendly balance. 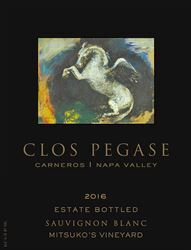 Clos Pegase is a 450 acre estate winery nestled in the volcanic hills outside of Calistoga. Our winery was designed by architect Michael Graves in an architectural competition juried by the San Francisco Museum of Modern Art. Our Post-modern building was established in 1984 and opened its doors in 1987. Clos Pegase is a feast for the senses! Upon arrival you will be amazed by the stunning architecture and welcomed with genuine down-to-earth friendliness from the staff. Join us on a tour of the property, including our dramatic caves. Tastings in our Visitor Center are educational, fun and delicious! Our wines are 100% estate and highly rated. We welcome you at Clos Pegase daily from 10:30am - 5:00pm. To join the wine club, visit www.clospegase.com or call 707-921-2603. Enjoy the benefits of our Pegase Circle Wine Club. Choose to have 4 or 12 bottles of our wonderful Estate Wines sent to you quarterly. You will be treated to special releases and a 20% discount on all wine purchases. 4 Daily Estate Flights and 2 Connoisseur's Cave Tours are complimentary for Wine Club Members and we have Special Events that you will receive invitations to. Call our Wine Club Manager for more information: 707-942-4981 ext. 209. Clos Pegase is certified under the Napa Green Winery Program by the Napa County Department of Environmental Management (DEM) and the Association of Bay Area Government’s (ABAG) Green Business Program and completed all the regulatory components needed for environmental sustainability. These components included developing water and energy conservation methods, preventing pollution, and reducing solid waste. In addition to developing sustainable winery practices, this program is set to become the standard for the state of California. Clos Pegase is certified under the Napa Green Certified Land Program. Clos Pegase has created and implemented a customized farm plan with measured results that addressed all aspects of its property, vineyard land as well as non-farmed land, including practicing soil conservation, water conservation, stable drainage, riparian corridor enhancement, fisheries and wildlife habitat enhancement and long-term improvement and sustainability.